Blogger Shane Burcaw finds humor in life with Spinal Muscular Atrophy in memoir STRANGERS ASSUME MY GIRLFRIEND IS MY NURSE. neuromuscular disease called Spinal Muscular Atrophy (SMA), which affects the spinal nerves and weakens the body’s muscles. He decided early on that embracing his condition would be a little easier if he could make jokes about it. Only in his twenties, Burcaw is already a successful blogger, published author, and founder of a non-profit. He’s probably best known for his blog and memoir Laughing at My Nightmare. Strangers Assume My Girlfriend Is My Nurse is a witty, sarcastic, and amusing collection of essays written by Burcaw. Each chapter/essay recounts a particular (funny) story from his life with SMA. Nothing if off-limits. There’s discussion of peeing himself on a bus as a teenager and also his girlfriend picking a piece of onion out of his teeth in public. I thought Strangers Assume My Girlfriend Is My Nurse to be a very enjoyable read. I was laughing out loud on the first page–and beyond. Athough not every reader may understand SMA going into the book, portions of Burcaw’s stories are relatable to just about anyone. Burcaw’s physical abilities may differ from the reader’s, but he’s looking for happiness, just like everyone else. And themes of embarrassment, self-deprecation, and trying to laugh through a harrowing situation are universal. Aside from being funny, there’s also a hint of romance in Burcaw’s writing, which I found very sweet and touching. Strangers Assume My Girlfriend Is My Nurse was also informative for me. Beginning the novel, I was unaware of what Spinal Muscular Atrophy was–at least, I was unfamiliar with it by name. I was glad to learn more about the disease, but mostly I was glad to learn more about it through Burcaw’s perspective. Digesting what a day for him involves lowered my ignorance level, which I am always thankful for. It was painful to read how Burcaw is often treated by strangers–heck, even by people he knows–because he is “disabled.” It was also eye-opening how many able-bodied people have no idea how to act around someone whose muscles work differently than theirs do. Burcaw’s words made me want to be a more informed and open person. I personally recommend checking out Strangers Assume My Girlfriend Is My Nurse. One could enjoy Burcaw’s writing for the humor, alone. There’s nothing wrong with appreciating the laughs. But really, one should read the book for the purpose of expanding one’s mind and heart. 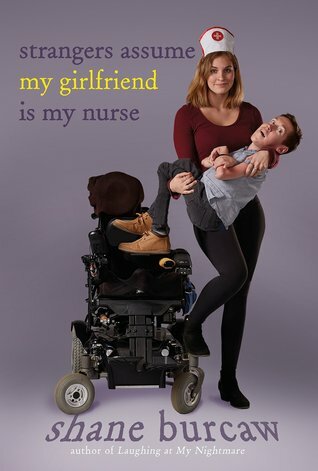 Strangers Assume My Girlfriend Is My Nurse hits shelves on April 30th, 2019. You can preorder a copy now via Amazon or support your local bookstore via Indiebound! With his signature acerbic wit and hilarious voice, twenty-something author, blogger, and entrepreneur Shane Burcaw is back with an essay collection about living a full life in a body that many people perceive as a tragedy. From anecdotes about first introductions where people patted him on the head instead of shaking his hand, to stories of passersby mistaking his able-bodied girlfriend for a nurse, Shane tackles awkward situations and assumptions with humor and grace. On the surface, these essays are about day-to-day life as a wheelchair user with a degenerative disease, but they are actually about family, love, and coming of age.